When asked for advice on how to succeed in the green industry, Nathan Brandon often thinks of one of his favorite quotes. These words of wisdom have guided Brandon’s green industry career, which began at age 12 when he started mowing his neighbors’ lawns for $45 per cut. In fact, he still remembers which home belongs to his very first client. Brandon and a business partner started a full-service landscape company called Turf Managers in 2000. After more than 10 years in business, Brandon says he and his partner began to have different visions of what the company should be. Brandon wanted to start shedding the types of services that require time-consuming consultative selling, such as maintenance and installations, and instead focus more on lawn care, which he says is quicker and easier to sell online or over the phone. About four years ago, Brandon made the difficult decision to sell his portion of Turf Managers to his partner and started Pure Green. 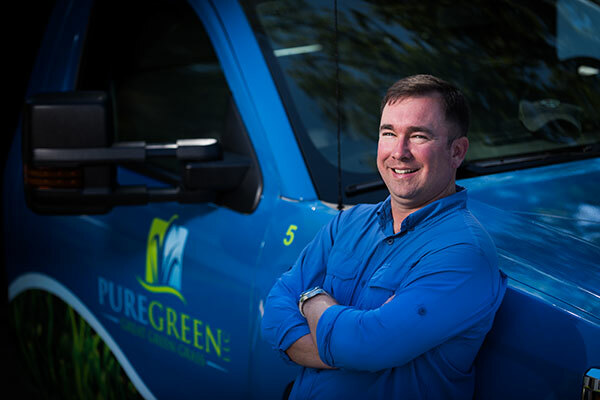 Today, Pure Green is a $1.3-million company that provides lawn care services to an 85 percent residential, 15 percent commercial clientele. Pure Green has seven employees, with an eighth set to join the team in early 2018. Brandon decided to build Pure Green’s lawn care program using Holganix, an organic, plant-based product that incorporates soil microbes, microbe food and nutrient enhancers to build resilient plants and healthier soils. This approach reduces his use of synthetic products by 50 to 80 percent, he estimates. Brandon markets Pure Green as an organic-hybrid company and says it’s a designation his customers appreciate. After starting Pure Green, Brandon’s initial goal was to reach $10 million in 10 years. He has since shifted that goal to $5 million in 10 years after realizing he was undercapitalized to get where he wanted to go in that time frame. Part of his growth strategy is through the acquisition of other lawn care companies. Two years ago, Brandon stumbled upon an opportunity to acquire a local lawn care company that was a “virtual perfect fit” for Pure Green. The company’s customer population increased his route density by about 35 percent, and he has retained 80 percent of its clientele. Brandon is currently working toward a second acquisition. He says any potential deals have to make sense both logistically and financially for him to consider them. He passed on an acquisition opportunity in 2017 because the customer base didn’t align with his routes. One challenge Brandon has faced as his company has grown is implementing the systems and processes necessary to keep things running smoothly. He acknowledges that he doesn’t have a background—or an interest—in this aspect of running a business. He employs a process he calls R&D, or “rip off and duplicate”—he tries to mimic what other business owners have done. He has gotten invaluable guidance and feedback through his membership in the Entrepreneurs’ Organization (EO), a network of business owners who are happy to share how their businesses operate. EO’s Nashville chapter has more than 200 members, and Brandon has been an active participant for 14 years. He also uses a consultant, paid on a monthly retainer, to help with this aspect of the business. Like many LCOs, Brandon says labor is a challenge for him, and he is always looking for quality technicians to add to his team. He finds his crew members “all over the place”—he has recruited them from competitors and from sister industries like pest control. He also runs ads on sites like Craigslist. Brandon makes it a priority to always have at least one or two potential workers in mind to avoid being placed in a predicament should someone leave the company during the busy season. While Pure Green’s future looks bright, Brandon isn’t sure he wants to stay in the green industry indefinitely. He doesn’t know exactly what he would do if he wasn’t running Pure Green, but he believes it would have something to do with helping other young entrepreneurs grow their businesses. Through EO, Brandon acts as a mentor and leads classes and forums to help startup companies get up and running—work he finds very rewarding. But for now, Brandon will continue to make the best decisions for his company and where he wants it to go in the future.